Can you believe it’s May already? As much as I dread the heat of the upcoming months of summer in the South, I love springtime and the lovely flowers it brings. Last week marked May Day, and I just love the holiday that marks a blossoming season. May Day is on May 1 and is celebrated by the delightful tradition of May baskets. These are small baskets usually filled with flowers and treats left at someone’s doorstep. The giver of the basket is to ring the doorbell and run away, leaving the cheerful surprise. Of all the holiday traditions, this one is especially my style as it celebrates some of my favorite things: flowers, giving, and a beautiful spring. The spring issue of one of our magazines, The Cottage Journal, features a wonderful piece on the tradition of May baskets. I introduced you to gardening expert Tovah Martin recently, and this story of hers is a marvelous example of her writing that is just a delight to see and read. 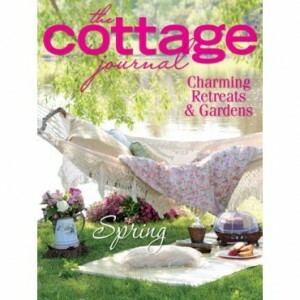 Pick up the spring issue of The Cottage Journal to read it and many other features celebrating this charming season. And remember, even though May Day passed, any day is a good day to bless a loved one with the gift of a blooming basket. What would be in YOUR May day basket? In France, May 1st is our Labor Day, national holiday, and everyone gets the day off. Also the Lily of the Valley has sprung up everywhere, and it is tradition to give a little bouquet of the divinely fraguant flower to every family member and friend, for “good luck”. I must also say that I love any perfume that has lily of the valley in it, like Jessica McClintock’s. I look foward to your inspiring posts, thank you. I totally agree, Michelle!! Jessica McClintock is the only cologne I wear and I get more compliments on the beautiful scent of it!! In Hawaii it’s a totally different tradition on May Day. Our school have a May Day program with each grade level doing a hula and wearing fragrant flower leis. 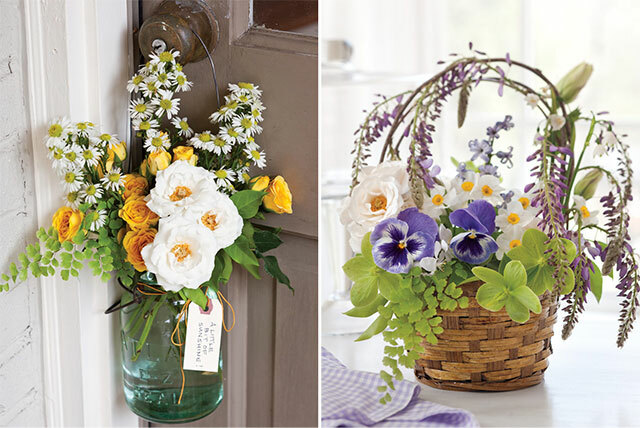 The thought of May baskets make my heart smile-such sweet memories of my Mother making them to leave on the doors of the home bound ladies in our town. Another May activity was the winding of the May Pole at school. Love it and sweet memories! This is a sad memory from my mother who grew up in SE MN during the Depression about May Baskets. On May Day a family that attended the same country school, came to class that day chewing gum. That evening, those children hung a May Basket on my mom and her sister’s front door. The basket usually contained wild flowers and treats. The tradition was that you had to chase the other kids down before you could have your May Basket. Kind of a Hide and Seek deal, anyway, my mom and little sis caught the others, so when they claimed their basket, they were super excited; thinking there would be gum inside of it. There was not, she told me that they ripped apart the basket trying to find gum. What a saddening thought that even a stick of gum was a special treat during the Depression era in our country. I’m from the midwest and we participated in this lovely tradition when I was a child to welcome spring. I remember some of the ingredients we used were popcorn, a sprig of lilacs, multi colored “pillow mints”, stick of gum, etc. We made them from a variety of things such as a paper doily, construction paper, plastic cups – what fun! I have found that many people I currently ask know nothing of this lovely tradition. Thanks for fond memories and my neighbors next year are going to be surprised!! I never knew about this tradition. Interesting and thank you!